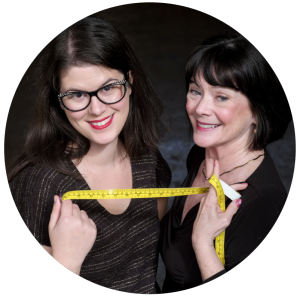 As promised Zede and Mal give you another podcast all about legging hacks. This time around they talk about the different ways to color block your leggings and what color blocking can help you achieve. Whether your goal is to have a slimming effect or enhance certain body features, color blocking can help you achieve it. Ok, so you want to color block but now what? Zede and Mallory discuss a couple ways in which color blocking can be achieved. Along the lines of color blocking is adding mesh inserts into the leggings. A super popular trend especially in the workout wardrobe is mesh panels. They can be down the side of the pants, only at them hem, basically anywhere you want when you make your own. Apart from being a style choice to show off some muscles or ink, mesh can also help with ventilation. Mal and Zede also share their ideas on their perfect pocket. Mallory describes her ideal pocket as one on her outer thigh that is just big enough to fit her phone. She doesn’t want a zipper but more of two layers of overlapping fabric to secure the contents. Mallory says she can’t decide if she wants all mesh, fabric/mesh combo, or all fabric for her pocket. She loves having so many options. Zede on the other hand prefers a zippered pocket, but as she’s the master of reducing bulk she’ll use an invisible zipper and mesh to construct her pocket. And if you thought that Mallory and Zede couldn’t possibly have more mods to try out, you’d be wrong. Another trend they have seen in ready to wear leggings that can be easily applied to self sewn leggings is latticing and slashing. Latticing is usually done near the bottom of the leg and is simply strips of fabric applied to the garment. Sometimes the fabric can be woven having a lattice look and other times they are simple horizontal stripes. As one might imagine slashing is as it sounds. The leggings will be cut revealing the persons skin underneath. These are not cutouts but literally slashes across the fabric. Have a favorite or planned legging hack you are wanting to try? Share with us in the comments! We’ll have to get the post updated- a little delay due to baby arriving! Do you have any photos or tutorials on this? Thanks so much!